Credit 101 is a part of the Future Cents project. Teens and adults are invited to learn more about establishing and repairing their credit score. It is all about the number! Learn what the number is. How to protect your score and more! Credit 101 will be held at the Cultural Center Boardroom next door to the Central Library. Mrs. Shiela Dalcoe will present from 6:30 to 7:00 and leave time for questions. You may register by contacting Martha Larson (373-4559). For more financial information and details about Future Cents visit www.myfuturecents.com. Frank Barefoot and I are now on holiday in the UK visiting former Greensboro Public Library colleague Heidi Schachtschneider-Williams and her husband Gareth, and yesterday we were lucky enough to see two very fine libraries in Manchester: the John Rylands Library, Deansgate, which houses one of the UK’s finest manuscript and rare books collections, and Chetham’s Library, which has the distinction of being the oldest public library in the English-speaking world. The Chetham’s Library is particularly ancient-looking. Dark and even a little foreboding, its shelves are filled with thousands of old leather and vellum tomes. 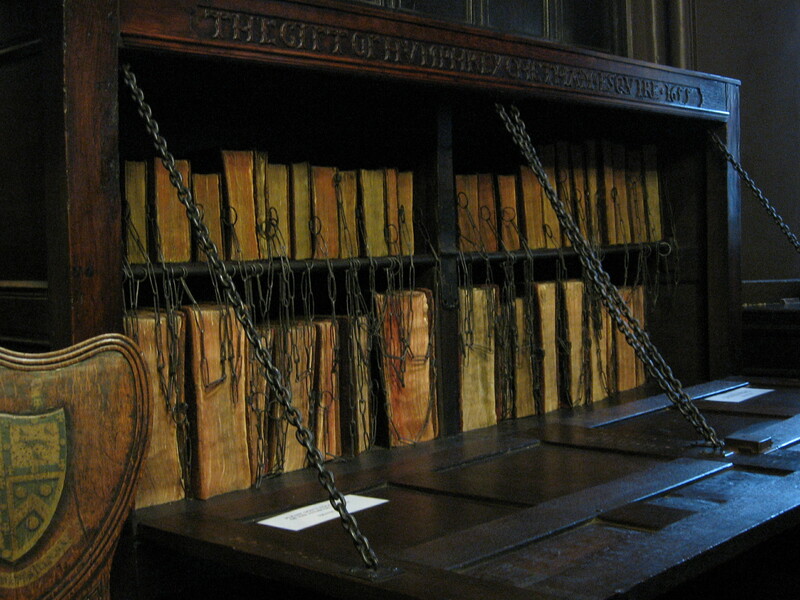 A reading room display even included a bookcase in which books were chained down so as to discourage theft, a practice which was apparently common from the Middle Ages until the 1700s. Crude but effective, I would say! The John Rylands special collections are housed in a magnificent example of gothic Victorian architecture built about 1900. The collections include important incunables (or examples from the first century of printing, 1455-1500) such as the Gutenberg Bible and the work of William Caxton, England’s first printer. In the Rylands exhibit area, I was lucky enough to see the second edition of Chaucer’s Canterbury Tales, printed by Caxton in 1483. There we also saw a tiny piece of Greek papyri from the 2nd century which is believed to be the earliest surviving fragment from the New Testament. Also, believe it or not, there was a book on exhibit in the John Rylands reading room which had been bound by a designer bookbinder from Greensboro! This was a copy of Andrew Marvell’s The Garden and Other Poems; the exhibit included work by bookbinders from around the world. Frank and I are having a great time. More posts from our journey will follow, including some pictures from Manchester’s Guy Fawkes or Bonfire Night, a huge event at the city’s Heaton Park which was held on Friday, November 5th, and attended by thousands. Possible Basis for the Story of Lydia, the Jamestown Ghost? I well remember reading Nancy Robert’s book An Illustrated Guide to Ghosts & Mysterious Occurrences in the Old North State when I was a little boy, and being fascinated by the story of the “lovely apparition” of a girl dressed in white who occasionally appears to passers-by near the old Highway 70 underpass at Jamestown. According to Roberts, the story goes back to 1923 when poor Lydia was killed in an automobile accident near that underpass on her way home from a dance in Raleigh. In later years, travelers on the highway on occasion reported being flagged down at that spot by a young girl looking for a ride home. But by the time they arrived at her destination, she had vanished. That, at least, is the story. There’s always been a lot of interest in the Lydia legend, and a few years ago, since I had an approximate date from the Roberts book, I decided to scan the microfilm of some of our old newspapers to see if I could find anything to support it. And what I did find was an article on the death of a young man from Asheboro named Harvey Yow, who was killed on his way back from a dance in Carthage in the early morning hours of 29 December 1923. Two of Yow’s companions were also injured — one, named Robert Bunch, had a serious skull fracture. The occasion was one of peculiar sadness because the young man met his death in an automobile accident. He, with two other Asheboro boys, was returning from Carthage where he had visited friends while his companions attended a dance. In attempting to pass a car Harvey Yow lost control of his car and it went in the ditch. In attempting to pull it back into the road the car swerved to the other ditch, turning over four times and instantly killing young Yow. Yow and the other young men seem to have been of considerable prominence in Asheboro, and they also had Guilford County connections — Yow and Bunch, for example, having both attended Oak Ridge Military Academy. Of course, the story of Yow’s death only matches a few of the particulars of the Lydia story. However, local legends often have some basis in fact only to become garbled over time, and if we can resist taking the Lydia story too literally and at the same time keep an open mind, I think the Yow tragedy can at least be offered as a plausible explanation. I know I’m not the first person to try to find some evidence for the Lydia story. For example, one of my colleagues told me that folks have searched Greensboro Public Library’s microfilm for her before. And a so-called ghost hunter has claimed to have turned up a death certificate in recent years. According to this website on the Lydia story, Guilford County records include a death certificate for a Lydia Jane M___, who died on 31 December 1923 (or possibly the 23rd) owing to “fatal injuries from a motoring accident.” My own ancestry.com (available in the library only) search does indeed turn up a Lydia Jane McCarthy who passed away in Guilford on 31 December 1923, but she was 76 and succumbed to heart disease at her residence in the Scott Apartments in Greensboro. Anyway, if you’re interested in the story of Lydia and want to conduct your own search, come on down to Greensboro Public Library. In addition to Nancy Roberts’ book, we’ve got local newspapers on microfilm as well as a vertical file on local ghost stories — all of which can aid your research. Future Cents in an interactive series of workshops that will help give teens a reality check about money management. How many of us as parents see them repeating our mistakes with money. Give them the tools that they need to succeed and not fall into traps. Take advantage of the free workshops that teach young people to live beyond today and investing in their future. For more: http://www.myfuturecents.com. See details about programs, information about the iPad drawing and resources. The kick off event is Monday evening, August 30 and will present banking topics and Keys to Money Mastery. Algenon Cash wears many hats in this community. As owner and managing director of Wharton Gladden & Company, writer, radio personality, and community enthusiast, Mr. Cash has his hands on many projects. 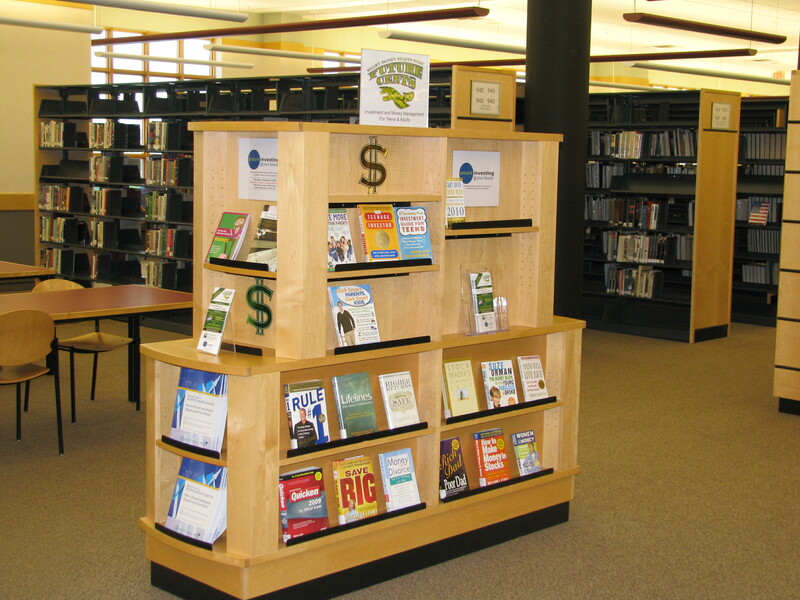 Currently, he is integrally involved with Future Cents, the Greensboro Public Library’s financial education project for teens. “I firmly believe that financial literacy is the civil rights issue of the 21st century. Americans do not understand basic skills such as how to balance a checkbook. Programs such as Future Cents are creating a discussion about a critical issue facing our youth,” says Cash. Fall series kicks off August 30. A runoff primary will be coming up on June 22, 2010. The polls will open at 6:30 a. m. and close at 7:30 p. m. If you are not registered to vote already, you will not be able to vote or register and vote on June 22. If you are a registered Democrat and were eligible to vote in the May 4 primary, you will be able to vote in this one. The Democratic contests are for the U. S. Senate and Guilford County Sheriff. If you are a registered Republican, were eligible to vote on May 4, AND LIVE IN U. S. HOUSE DISTRICTS 12 OR 13, you will be able to vote in this one. The Republican contests are in U. S. House Districts 12 and 13. If you are registered as Unaffiliated, then: If you DID NOT VOTE in the May 4 primary, you can vote in the Democratic primary; or, if you DID NOT VOTE in the May 4 primary, and IF YOU LIVE IN U. S. HOUSE DISTRICTS 12 OR 13, you can vote in the Republican primary. If you VOTED A DEMOCRATIC BALLOT IN THE MAY 4 PRIMARY, you must VOTE A DEMOCRATIC BALLOT IN THIS PRIMARY. If you VOTED A REPUBLICAN BALLOT IN THE MAY 4 PRIMARY and you live in U. S. House districts 12 or13, you must VOTE A REPUBLICAN BALLOT IN THIS PRIMARY. If you VOTED A NONPARTISAN BALLOT ONLY IN THE MAY 4 PRIMARY, you cannot vote in this primary. If you are registered as a Libertarian, you cannot vote in this primary. To see a sample ballot, you can to the the North Carolina State Board of Elections website. Then, click on Click here for sample ballots. Next, click on your county. Finally, ORGUIL1 is the Democratic sample ballot. ORGUIL3 is the Republican sample ballot for U. S. House District 13. ORGUIL4 is the Republican sample ballot for U. S. House District 12. To find out your precinct and polling place, you also can use the North Carolina State Board of Elections website. Once there, click on My Election Information. Next, put in your first name, last name, date of birth, and county. Your voter information will come up. Included will be precinct number and polling place. As a final note, these other categories of voters will not be able to vote in the June 22 primary: 1) Registered Republicans who live in U. S. House District 6; and 2) Unaffiliated voters who chose the Republican ballot on May 4 and live in U. S. House District 6. If you are eligible, please vote on June 22 and let your voice be heard!